When he moved to Sicily in 2000, Jim Kerr was introduced to the dance producers and DJs Dino Maggiorana and Stefano Sorrentino. Running the label Absolutely Records, they recorded and remixed under the name of Phunk Investigation. Their first collaboration was Gloria, which appeared on Neon Lights. Dino Maggiorana co-wrote Cry, New Sunshine Morning and Sleeping Girl for the Cry album. Further collaborations included remixes of Cry and Spaceface. Further new mixes of Don't You (Forget About Me) and One Step Closer appeared under the Biba-Rom guise (borrowed from an old school band.) New Gold Dream was also remixed, a collaboration with DJ T, and appeared as Gold Dreamer. Dino and Stefano suggested further new remixes of older Simple Minds material. 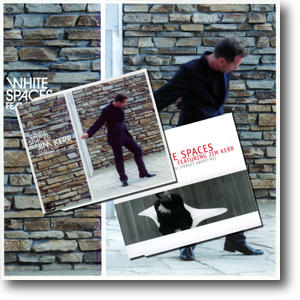 Jim obliged, asking that the duo change their name to White Spaces; the meaning behind the naming appearing twofold: being partly inspired by their promo photograph, which was printed as a negative; and it suited the concept of making a musical outline to be filled in by guest artists. This first single as White Spaces was a commercial repackaging of the first Don't You (Forget About Me) Biba-Rom promo. The In The City Mix was by Phunk Investigation whilst Andrea T. Mendoza Vs Tibet provided the Club Mix . Eyerer's & Laib's Radio Mix first appeared on this release, and subsequently turned up on Don't You (Forget About Me) 2003 by Simple Minds. A CD was expected in January 2004, but retail orders were cancelled as the release was 'withdrawn'. This was not surprising considering how similar the Don't You (Forget About Me) 2003 release was. But, a five track CD did eventually surface, featuring two of the tracks from Don't You (Forget About Me) 2003. In May 2004, the single appeared in Australia (as the band were planning to tour there), with a new sleeve and new tracklisting. The six tracks featured the first commerical release of the Stefano Sorrentino remix. Additionally the Perky Park remix was slightly different, with additional crowd noise over the end of the song. A version from Greece also turned up during 2004. Released through Columbia Records, it featured unique "beach" artwork and a unique track listing which featured the hard-to-get Adam Dived remix and the unique Ged 5 Electtro Bitta Mix . The single was released as an MP3 download in May 2008. Two additional exclusive remixes were made available in this package: the Macaroni Sound Remix and Bravo Vulcan Screen Remix .